The Tudor composer Nicholas Ludford (d1557) spent most of his life attached to St Stephen’s Westminster. A box set of his major works was issued by The Cardinall’s Musick ensemble on Asv/gaudeamus in the early 1990s, which included two of the works here – the Videte Mass, and Ave Maria ancilla Trinitas. The Cardinall’s group is smaller (13 voices, some of them female) than the Westminster Choir (30 voices, men and boys). This means that, by comparison, the current recording has a more ‘monumental’ sound, and also (given its more resonant acoustic) the texture is less translucent. 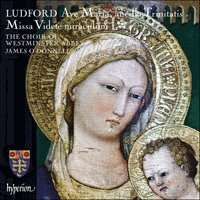 That said, James O’donnell and the Westminster singers really understand this music and make a fine case for Ludford being a true (if neglected) master of polyphony. The disc kicks off with some serene, measured singing in the Kyrie interspersed with stunning organ interludes (created by O’donnell) between the sections. The Alleluia hardly puts a foot wrong in terms of the organic growth of the music, and the same is true of Hac clara – though they could perhaps have let their guard down a little at the words ‘joyful acclamations, shouting out for Mary’, and it is hard not to raise an eye brow at the sweet boys’ voices singing in Latin about the gynaecological details of Mary’s pregnancy. Their greatest skill is shown in their handling of the intricacies of the Videte mass, with its ecstatic running exchanges at ‘Dominus Deus’ in the Gloria and the ethereal visions of the Agnus Dei.